Tsepang is an 18 month old boy who came to the safe-home a week ago. Brought to the Outreach team's attention at a rural clinic visit, both twins were malnourished but Tsepang was by far the worst off and showed signs of TB (suggesting a good explanation for why he wasn’t developing as well as his sibling). He is now on TB medication and spending time in the safe-home to support his recovery while his twin stays at home and the Outreach team makes regular visits. Also last week, a Village Health Worker in the St. Martin region – one of the more isolated parts of Mokhotlong – referred TTL to a household where triplets had been born only five days previously. The Outreach team immediately brought the mother and three little ones to the Mokhotlong hospital where they will now stay until the babies weigh 2 kg. After we heard about the story of the triplets, myself and the other volunteers sat around talking about how amazing it was that the mom and three babies were all relatively healthy. The mother is young – around 17 or 18 – and while this is not her first child, the idea of giving birth to three little babies in a mud rondavel with no medical support in the rural mountains of Lesotho astounded us all. I’m continually amazed by the strength of Basotho women and this story has now only furthered my awe of the many challenges these women overcome to raise healthy children. Tsitso, one of the many twins I have met during my time in Mokhotlong. 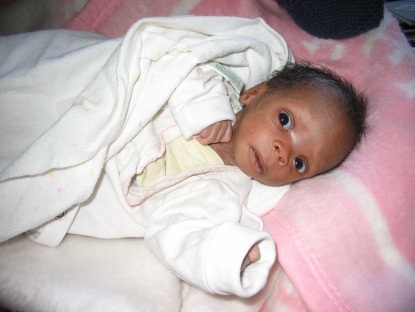 He spent time in the safe-home from October 2011 to February 2012, going from weighing a tiny 1.7kg to a healthy 5.7kg. 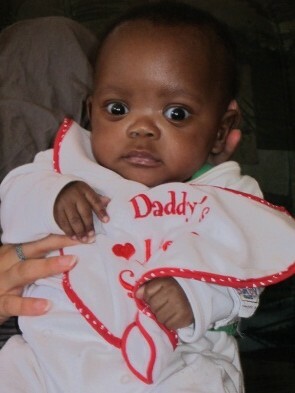 Now 7 months old, he is back at home with his twin sister and the Outreach team continues to make regular visits.